Lately I’ve written about some of my favorite foods from my mother’s Hungarian inflected kitchen, but I’m also fascinated by how the Hungarian palate has influenced some of my other food choices. We grew up eating spicy foods. My mother was a great cook and a great hostess but there were times when I thought she should issue warnings to her guests about the spice levels in the food. At the very least, as a snarky teenager, I suggested that she should offer each guest a personal pitcher of ice water. In fact, there was one year when she accidentally put hot peppers in the chicken soup she made for the meal that we ate just before the Yom Kippur fast. I’m sure that some of those guests still remember that very spicy soup 35 years later. That was an occasion when the personal pitcher of ice water would have been a necessity and not just optional. This love of spicy food has carried over into my current family (especially Ms. Dot Jr. and me) and our love of spicy Asian cuisines. We would be happy to eat Asian food all the time, especially since I’m including Southeast Asian and Middle Eastern which gives us a lot of great flavors–and spice to work with. To be totally honest, Mr. Dot needs his pasta like any boy who grew up in North Jersey. He may not be Italian but he eats like one. That’s a whole other story and a blog post for another day. If you’ve read (and tried) some of my other recipes, you know that in addition to heat, I love coconut and other flavors found in Asian cuisine. In this recipe, spicy heat and coconut and some other great flavors come together with leftover chicken for a Thai inspired chicken noodle soup. I hope I’ve already sold you on how delicious this Thai inspired soup is. The other reason to make it is that it’s incredibly easy AND it will help you use up leftovers. I love repurposing my leftovers. I (and the rest of the Dot family) get fed up with leftover chicken as plain old reheated chicken, Even if we loved this chicken last night or two nights ago, it’s less fun when it makes its appearance as leftovers. 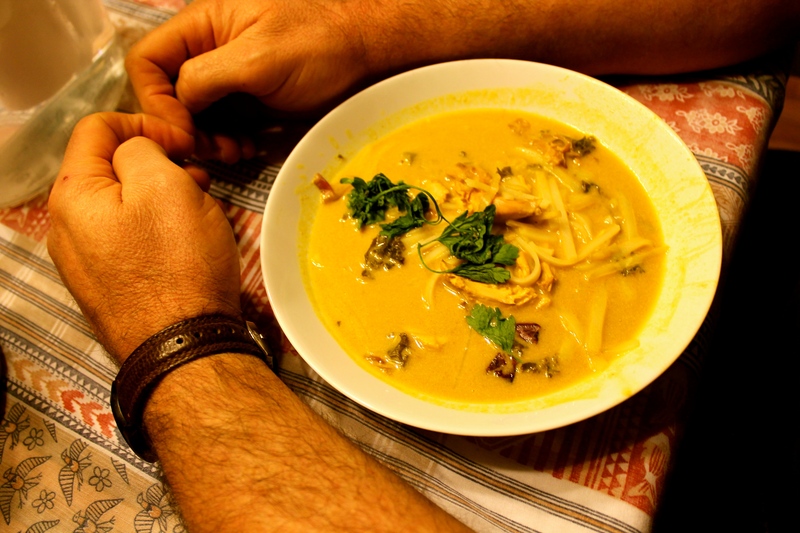 This soup recipe requires very little work, but it totally transforms the leftovers into something new, delicious, Thai-ish, hot and (on a cold winter night) soothing. To be fair, it might not be the last thing you want to eat before you fast on Yom Kippur–or if you do make it before a fast, you might want to leave out the ginger, chili, and fish sauce. Mr. Dot is served (his personal pitcher of ice water is just out of range of the picture which was taken by REG). If you have home-made chicken broth to use, it will be super, extra wonderful. It is easy to have broth on hand and store it in small containers in the freezer. But if you just use regular old store-bought broth, it will also be good. I like the broth that you can buy in boxes and frankly I have no brand loyalty, although I generally have some low-sodium no-chicken broth on hand for throwing together various quick meals. 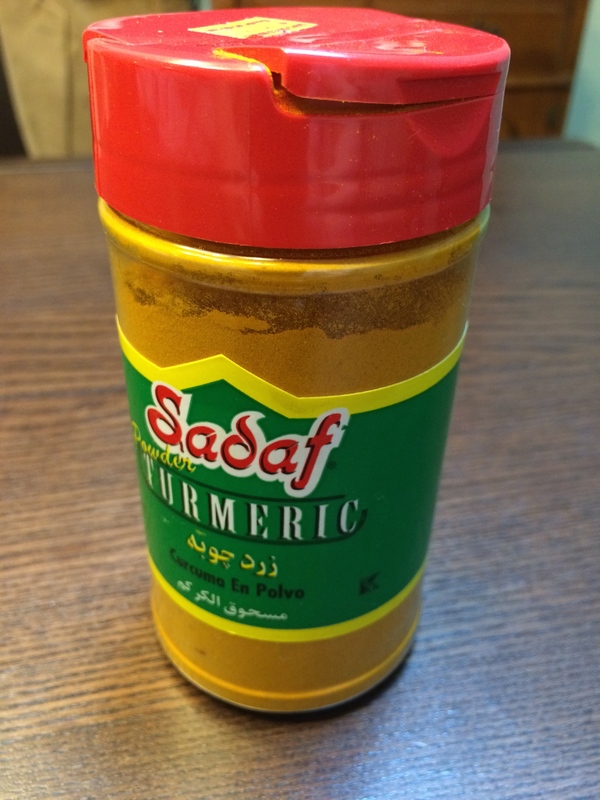 We need to super-size the turmeric around here, thanks to the way our Hungarian palates have adapted to Asian and middle-Eastern foods. Thank goodness for Yekta and other local markets. Place noodles in a large, heat proof bowl and pour boiling water over noodles and let stand while soup cooks. This should cook the noodles. Alternatively, follow instructions on noodle package. Heat chicken broth in large saucepan. Add remaining ingredients except snap peas, carrots, bean sprouts and cilantro to the pan and bring to a boil. When the chicken is piping hot, add peas, carrots, and sprouts. After a few minutes, add the drained noodles. Serve in bowls, topping each bowl with chopped fresh cilantro. This actually isn’t so spicy that you will need individual ice-water pitchers for each guest, but if you like extra spice, knock yourself out and add some extra chili.